The Canadian Mental Health Association (CMHA) joins the Canadian Centre on Substance Use and Addiction (CCSA) in observing National Addictions Awareness Week (NAAW), November 12-18, 2017. This annual, national awareness week highlights issues and solutions to help address alcohol and other drug-related harms. The theme for NAAW 2017 is “Words Matter”, focusing on how the use of stigmatizing language can perpetuate false and harmful myths around substance use and addiction, and act as a barrier to recovery. Language can affect how the public thinks about substance use and recovery. Research demonstrates that the use of certain words and terminology can create biases that influence how society treats people and groups. Words can also have an impact on the individual who uses substances, impacting how people think about themselves, and about their ability to make changes in their lives, including whether or not to seek health care. While words can cause and perpetuate stigma, they also have the power to undo stigma. Using the “language of recovery” can inspire hope and promote recovery. 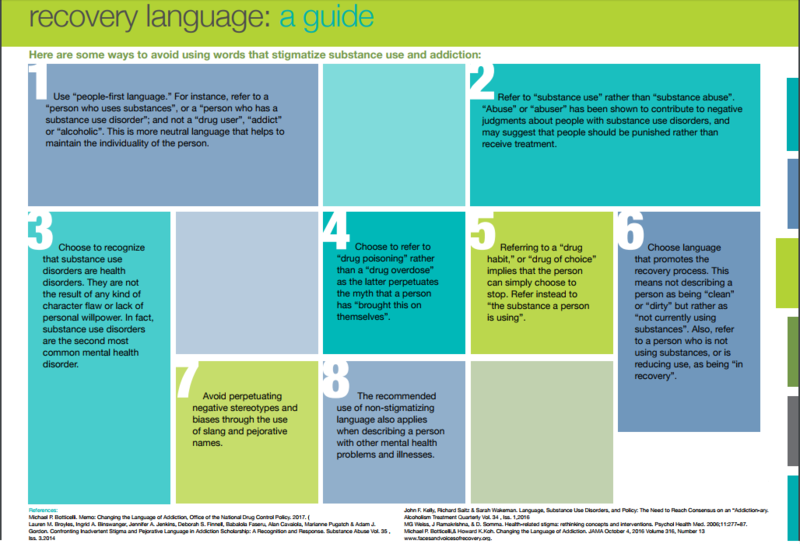 Below, we have included a guide outlining the “language of recovery”, including simple changes you can make in your vocabulary to help break down the stigma surrounding substance use. The Canadian Centre for Substance Use and Addiction changed its name this year, eliminating the term “Substance Abuse”. This is an acknowledgment that words do, indeed, matter. People with mental illnesses are twice as likely to develop a substance use disorder than people without mental illness. People with substance use disorders are 3x more likely to have a co-occurring mental illness.